I recently tried out the Andrew Barton Ultimate Blonde treatment mask (see in my monthly empties post here) that I received in a goodie bag. I really loved using it and it made me want to try out more of the range. Before I could even venture out to find where I could buy it Andrew Barton got in touch via my Facebook page (facebook.com/champagneandlemonadeox) and asked if I would like to review more of the Ultimate Blonde collection. I was obviously rather excited and keen to try them. I have been using them for over a week now and Im so in LOVE. I think the main attraction for me is the smell, it just makes my hair smell sooo amazing. It keeps blonde hair looking bright and hydrated which is needed in this hotter weather we are having as my hair seems to be more dry and damaged from the sun. Heat protecting spray isn't something I always use (Naughty I know) but because of the small its made me reach for it so much more. I have really enjoyed using them, I usually feel like washing my hair is such a chore and I just usually grab the dry shampoo but I have been making so much more effort ! I was pleasantly surprised at the prices of the products too. Each one is £3.90 and are all exclusively available at Asda stores.I think that is very affordable for the quality of the products and I am now so hooked please can I have a years supply? I am looking forward to looking at more products by Andrew Barton and compare to these ones. 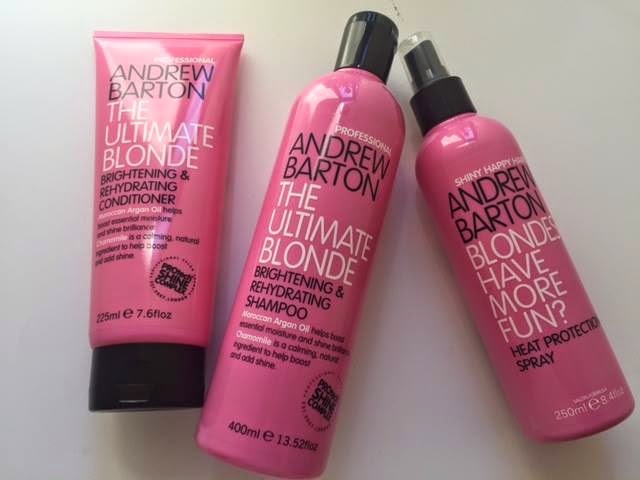 Have you tried any Andrew Barton Products ? What do you use to keep your hair on top form?